Home > Overview > What is Gluten? Food allergies are very common. Most us will know someone who has a nut allergy for instance. These people suffer very serious reactions when they eat nut products. Or someone who can’t eat shellfish without suffering a nasty reaction. Gluten allergies are really just another type of food allergies but the sufferer is allergic to the gluten substance that is contained in the food. 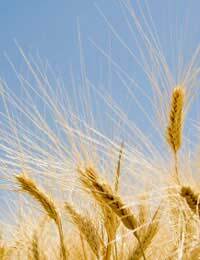 Gluten is found mostly in rye, barley and wheat. These grains can be found in many food products we consumer daily without us even realising it. Everytime we reach for a bowl of some of the UK's most popular cereals or have a piece of toast for breakfast we are consuming gluten. For most of us this is not a problem. But for those people with a gluten allergy it is a serious problem. It is easy to get confused and think that gluten is in many other grains or even all grains but many of them are safe. Rice, for example, does not have any gluten in it. Corn is also free from gluten as is quinoa and soybeans. In bread it is the gluten which makes the dough stick. It is possible to remove gluten from wheat flour though which is used to make bread. This is done by rinsing out the dough and kneading it. Gluten allergies affect people who have an intolerance to gluten. When sufferers consume any food with gluten in they suffer various illnesses and reactions. Many of the symptoms are long term and may not be immediately apparent as a reaction to gluten products. In severe cases gluten allergies can cause major health problems. Most seriously a gluten allergy left undetected can increase the sufferers chances of contracting cancer of the bowel. Depression is also a symptom of gluten intolerance. Sufferers may feel moody, low and tearful. They may also suffer from fatigue and feel sluggish and unenthusiastic for anything. Less severe symptoms are also common with gluten allergies. Sufferers can experience bowel problems such as constipation and diarrhoea. They may feel bloated and uncomfortable and could feel sick when they have consumed gluten. Weight loss and slow growth in children are also well-known symptoms of gluten intolerances. Both adults and children could suffer from attention difficulties and learning problems. Gluten allergies are not uncommon and while there is no sure fast cure the illness can be controlled and managed with a special diet. There are plenty of gluten-free products on offer on the market so sufferers needn’t miss out too much. If you think you may have a gluten allergy then you should seek advice from your doctor and ask him or her if you can be tested for the allergy. Once the intolerance has been detected and diagnosed the sufferer can learn how to manage their illness and live a happy and full life. Gluten allergies are serious but they are not unmanageable. They are also more popular than one might think.